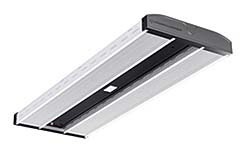 I-Beam LED high bay luminaire is designed for one-for-one replacement of HID and fluorescent systems with mounting heights from 15 to 40 feet. Die-formed aluminum alloy chassis includes integrated fins for cooling through natural convection and is designed to resist twisting and bowing. Channel is made of 20-gauge steel and has a back access plate for wiring access. Focus, narrow and wide distributions available. Lifetime of 92 percent lumen maintenance at 60,000 hours.